The building contractors listed here are known for specialising in building conservation, or have specialist teams of craftsmen. Historic Building Conservation/ Restoration/ Alteration and Specialist Joinery Manufacturers. Established in 1878, Bakers is a traditional contractor specialising in conservation and repair of historic and listed buildings, churches, ancient monuments and residential properties. 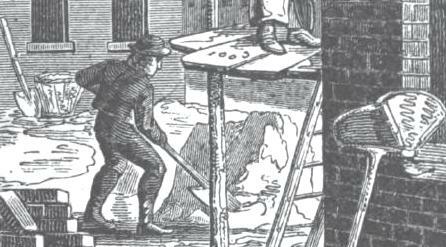 The company's expert stone masons, carpenters, joiners and other tradesmen have long been associated with many of the region's fine buildings. The specialist joinery department provides a full design and manufacture service for high quality joinery and furniture for civic, private and ecclesiastical clients. Winners of the RICS conservation award 2011 for the East of England and joint winners of the RIBA conservation award for London 2012. Bryan Williamson & Daughters has been specialising in the renovation, extension and refurbishment of period properties for over 20 years. Working sympathetically with heritage and listed buildings, they have restored over 200 houses and listed buildings back to their former glory. Combining extensive experience in traditional construction methods and craftsmanship with knowledge of specialist techniques, we provide our clients with practical advice whilst offering a wide range of services. They work in Central, South-East and South-West London, Kent, East Surrey and East Sussex. Cleaning of stone, brick and stucco uses the Jos & doff cleaning systems. Lime rendering is also available. Carrek specialise in the conservation of historic buildings, offering the skills and expertise required to ensure careful and sensitive repair and are experienced in managing contracts across a range of sizes, including the large and complex, delivering projects on time and to budget. Clients include Historic Royal Palaces, English Heritage, the Churches Conservation Trust, the Prince’s Regeneration Trust, local authorities and private clients. Skills include stone carving, masonry and conservation, lime pointing, traditional carpentry and joinery, specialist cleaning, structural repairs and consolidation, lime rendering and plastering, historic paintwork and decorations, roofing and lead work, ornamental plasterwork, gilding and limecrete floors. Cbs are building contractors, based in Shropshire who deliberately maintain a small company profile meaning our considerable expertise and experience is precisely where its needed most, on site; keeping it small allows us to provide our clients with a level of personal attention rarely found in larger organisations. Services include stonemasonry, lime plaster, render, pointing and repair, specialist cleaning using Jos, Vortech, Thermatech and Doff systems, and carefully selected chemicals and poultices, decoration, joinery and carpentry including timber frame repair, roofing, new building and structural anchors. The CEL Group is a principal building contractor for its own projects, taking responsibility for the management of all the primary trades involved, including stonemasons, carpenters and slaters. With the encouragement of architectural practices, the CEL Group has a firm commitment and presence in the ecclesiastical and heritage building sector. It has a broad skill and service base which, as well as being a specialist lead roofing contractor, includes the use of non-ferrous metals such as copper, zinc and stainless steel. It is also one of the few European manufacturers still creating sandcast lead sheet. Country House Renovations is an established specialist building contractor, adept in building renovation of Listed and period properties. Located in the north Cotswolds we undertake high quality traditional building projects throughout Gloucestershire and the adjoining counties of Worcestershire, Warwickshire and Oxfordshire. Our primary field of work is the alteration / restoration of domestic property particularly for the discerning client using our employed team of highly skilled tradesmen who include stone masons, carpenters/joiners, stone slate roofers, lime plasterers and painter/decorators. Projects undertaken vary from the modest repair and maintenance job to the complete property renovation / new build project. Daedalus Conservation is the specialist historical repair and conservation division of the traditional building contractor, R W Armstrong. It is an experienced principal contractor and specialist trade contractor, based in the South West but operating throughout the UK. Daedalus Conservation specialise in the repair and conservation of historic buildings, providing expert consultancy, advice and design, as well as offering all of the associated principal services; stonemasonry, carpentry and fine joinery, heavy oak carpentry, lime plasterwork and brickwork. A long established company with Kevin Dunne as your main contact. They specialise in restoring and renovating older character properties, including listed buildings; also work with English Heritage, a good measure of their credentials. Members of the Federation of Master Builders, the Guild of Master Craftsmen, SPAB and IHBC. Heritage Restoration is an established construction company specialising in restoration and extension of period properties and listed buildings. Our team of highly skilled and experienced experts, trained in all aspects of building and restoration, take great pride in the excellence of our workmanship. We believe passionately in protecting and maintaining our environment for present and future generations to enjoy, reflected in the quality of our craftsmanship from stonemasonry to carpentry, joinery to plastering. As a client, you can be assured of the highest standard of service, tailored to your specific requirements, competitively priced and undertaken with a minimum of fuss. Houghtons of York are a well established family run business with a wealth of experience specialising in high quality architectural joinery and woodcarving for clients throughout the UK. With workshops based in York we employ a team of highly skilled craftsmen and use traditional methods and materials to produce a broad range of bespoke commissioned work including casement and sash windows, doors, staircases, libraries, panelling, kitchens, building work, fireplaces, oak frames, ecclesiastical joinery, furniture and gates. Our works encompass new build, restoration, conservation, repairs and maintenance and we invite enquiries from York, North Yorkshire and nationwide. Owlsworth IJP is a company that has an understanding and appreciation of traditional properties, building techniques and materials, with years of experience in the sympathetic and careful repair of properties. Clients include The National Trust, English Heritage, Historic Royal Palaces and several County Councils as well as numerous private clients.They employ their own highly skilled team of craftsmen capable of providing a host of traditional craft skills, using techniques passed down the generations. These skills include carpentry, joinery, plastering, bricklaying, stonemasonry, blacksmithing and millwrighting. R W Armstrong is a residential builder which has for decades provided high quality building services across most of South-East England. Its traditional ethos and expert craftsmanship has built a reputation for high class refurbishments and renovations of country homes, period town houses, listed properties and historic buildings. Core to the company’s success is the ability to combine the latest construction technologies and sustainable building methods with traditional craftsmanship, whilst remaining sympathetic to the historic fabric of the property. Offices are based in Hampshire, London and West Sussex. R J Smith & Co are traditional builders who have been established in Hampshire for over thirty years. During this period, they have developed a specialist business dealing exclusively with local historic and listed buildings and the construction of quality new building works. They have successfully completed projects with both large and small contract values and have developed a wealth of experience in all aspects of new and historic building work. Their dedicated joinery division that specialises in traditional hand made joinery. Reynolds Conservation Ltd is a conservation and restoration company based in Ludlow, Shropshire. We have a wealth of experience and a reputation for expertise in the restoration, conservation and repair of traditional and historic buildings. We are repair specialists with in-house expertise such as, stone masonry, roofing, carpentry & Joinery. Carter Heritage provides a specialist service predominantly throughout East Anglia. Traditional craftsmanship and respect for the visions of a bygone age are crucial to R G Carter Heritage. Its client portfolio ranges from private individuals to public guardians - including English Heritage and the National Trust. St Astier is a historic building conservation contractor operating across the North of England. The company has a wealth of experiencing in conserving and repairing Grade I and II listed properties, Scheduled Ancient Monuments, masonry ruins, ecclesiastical buildings and other structures of historic importance. Specialist building conservation services include natural stone repair and conservation, sensitive masonry cleaning, hidden/non-invasive structural repair and reinforcement, historic timber preservation, concrete repair & protection, and the installation of non-invasive helical screw piles and ground anchors for stabilising retaining walls. Building Contractors : Award winning period & listed property services. Over 25 years experience in the care, maintenance, conservation and refurbishment of historic, listed and period properties all sizes and construction. St Swithuns Building & Conservation specialise in refurbishment, renovation, conservation and traditional building, stone, masonry, plastering and brick works, traditional carpentry, joinery and oak framing, lime & cob works, stone & wood flooring, decorating & interior finishing, kitchen, bathrooms and bespoke fittings, external landscaping and garden features. All construction, mechanical & electrical work to the required building control legal standards and approved to English Heritage, council & listed building regulations. Stewart Truman create, restore and maintain luxury and historic property. Services we offer are brickwork, tuckpointing & stonework, refurbishments and restoration & conservation. Working throughout London and the surrounding areas. T. Coleborn & Son Limited is a family run business originally formed as a Partnership in 1783 and becoming a limited company in 1998. We have grown our business and excellent reputation over the years specialising as a main contractor on small to medium refurbishment, alteration and maintenance projects in the South primarily within the public and commercial sector. We undertake general building and structure refurbishments including decoration, carpentry, plastering, brickwork and structural alterations. Our historic building services include refurbishment, limewash and distemper decorations, lime mortar, traditional plastering, specialist brick renovations including arches and bespoke carpentry. We are a family business with years of experience converting, altering or restoring period, listed and historic buildings within Somerset and surrounding area. We have the skills and knowledge to sympathetically and sensitively convert and restore your listed property. We undertake cob repair, lime work, roof repairs, carpentry and joinery, stone masonry, as well as general building work, from roofs to extensions, oak floors to painting and decorating. Universal Stone Limited is a leading specialist contractor in building conservation and restoration, and in the manufacture and installation of all types of natural stonework and other historic building materials such as brickwork, terracotta, faience, rendering and plaster. Established in 1939 as a traditional masonry company working on the repair and cleaning of all types of historic buildings, over the years the Company has evolved into a principal contractor in its field encompassing an extensive and varied range of associated trades including roofing, lead work, joinery, glazing, decorative metalwork, decoration and structural repairs. Walter Lilly is a specialist building contractor in London and South East England. They focus on two specialist areas: prestige projects including high quality refursbishment and restoration of historic buildings and science & education. Their prestige projects portfolio includes private residences, listed buildings or those of historical interest, often involving both challenging structural work and specialist finishes.